The Natasha Collection features rows of shirring and ruching for a modern romantic appeal. Available in a variety of neutral colors, this is for the Pearl White color. 100% cotton. By VHC Brands (formerly Victorian Heart). The Natasha Collection features rows of shirring and ruching for a modern romantic appeal. 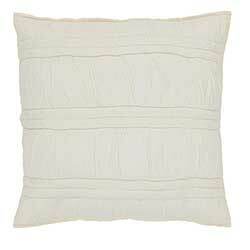 Available in a variety of neutral colors, this is for Euro Sham in the Pearl White color. The Natasha Collection features rows of shirring and ruching for a modern romantic appeal. Available in a variety of neutral colors, this is for KING sized quilt in the Pearl White color. The Natasha Collection features rows of shirring and ruching for a modern romantic appeal. 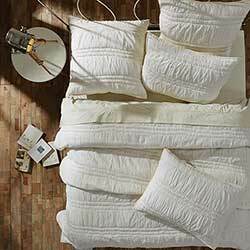 Available in a variety of neutral colors, this is for LUXURY KING sized quilt in the Pearl White color. The Natasha Collection features rows of shirring and ruching for a modern romantic appeal. Available in a variety of neutral colors, this is for QUEEN sized quilt in the Pearl White color. The Natasha Collection features rows of shirring and ruching for a modern romantic appeal. Available in a variety of neutral colors, this is for TWIN sized quilt in the Pearl White color. The Natasha Collection features rows of shirring and ruching for a modern romantic appeal. 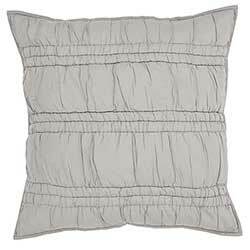 Available in a variety of neutral colors, this is for Euro Sham in the Urban Grey color.